The North zone police station of state anti-corruption and vigilance bureau (SVACB) have registered a case under sections 420, 188, 120B, of Indian Penal Code (IPC) and section 13 (2) of Prevention of Corruption Act ,against Himachal Pradesh Cricket Association (HPCA) chief Anurag Thakur and his younger brother Arun Thakur for forging documents to purchase a piece of land. The North zone police station of SVACB registered the case on Thursday. 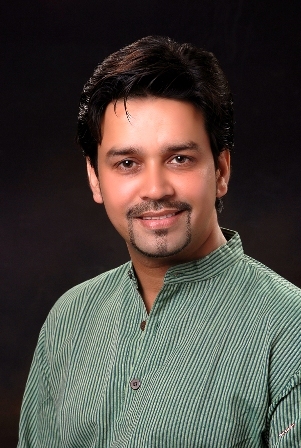 Both Anurag Thakur and his younger brother Arun Thakur are sons of former chief minister Prem Kumar Dhumal. Bimal Gupta, superintendent of police (vigilance), North, while confirming the registration of fresh cases, said that Anurag and Arun had purchased 32 marlas of land at Kalapul on Dharmsala-Mecleodganj high way by forging the documents. "It was an allotted land and could not be sold or purchased before 20 years", said Gupta.Gupta further informed that yet another case was registered on Thursday against Himachal Cricket association (HPCA ), f under section 447 and 120 B of IPC and 13 (B) of Prevention of Damage to Public Property Act for encroachment on 720 square feet land of state sports department near Dharamsala cricket stadium. Rajya sabha member Anuraag Thakur is President of HPCA. Earlier too HPCA got a major setback when HP High Court on 19th September dismissed HPCA’s petition seeking quashing of the show-cause notice issued to it by Registrar of Societies. Where registrar asked HPCA on September 7 , to why it should not be removed u/s 41 (1) of the HP Societies Registration Act, 2006, for its alleged acts of omission and commission. The Registrar of Societies, HP, had also restrained the Governing Body of the HPCA from passing any order or resolution, or to make any expenditure or investment or banking transaction or perform any other act concerning the affairs of HPCA, without its approval.The Registrar had further directed the HPCA Governing Body to function under the superintendence, direction and control of the authority of the Additional Deputy Commissioner, Kangra at Dharamshala. The HPCA had challenged the Show Cause notice in the High Court submitting that it was converted to a Not for Profit company on October 1, 2012 and hence, it is not a registered Society, therefore, the Registrar of Societies, could not exercise any jurisdiction over it.And on Oct 1, Himachal Pradesh Cricket Association (HPCA), said that the notice sent to it by the registrar was not maintainable as it was a registered company and not a society. "HPCA is no longer a Society under Registration of societies Act, but a registered company and the notice sent to it (HPCA) by the registrar of Societies was not maintainable," an official said. HPCA, in its reply submitted to the cooperative societies claimed that the notice issued to it "is not maintainable". Earlier this year The Himachal Pradesh unit of the Congress accused BJP MP and state cricket body administrator Anurag Thakur for alleged wrongdoings in the allotment of land to the sports body. Accusing Thakur of allotting land to the cricket body for building a residential complex for players near Dharamsala’s picturesque stadium, the state Congress said in a statement: “The land given on lease to the Himachal Pradesh Cricket Association (HPCA) was for making grounds for playing cricket and not for commercial activities.” The matter is also under scanner.Anuraag Thakur took over as the President of HPCA in 2000, during the Chief Minister ship of his father K Dhumal. It is alleged that he amended the constitution as such that only paid members have the majority to choose the President of HPCA,and all such members are from his near and dears.